§ Or, what is the nature of light and how does it comes to our eyes? The Luminiferous Aether was imagined by physicists since Isaac Newton as the invisible "vapor" or "gas aether" filling the universe and hence as the carrier of heat and light to our eyes, although we now understand by Maxwell's equations that these are both a unified electromagnetic phenomena. Further, the "Corpuscular Theory of Light" promulgated by Isaac Newton set forth the idea that light is composed of small discreet particles or corpuscles. In this sense, the corpuscular theory of light resembles the modern photon quanta, but the theory failed under conditions of "light interference" and "diffraction" or the bending of light. According to Maxwell's equations, light is a self - propagating electromagnetic transverse wave with electric and magnetic components where the oscillating electric and magnetic field components induce their respective opposites and vice-versa. These electric and magnetic components oscillate at right angles to each other and propagate perpendicularly to the direction in which they indefinitely travel unless absorbed by intervening matter. That is, each kind of field - electric and magnetic - generates the other in order to propagate the entire composite structure moving forward through empty space at the finite speed of light, c.
The type of light used in an interference experiment will be where the ( two ) light waves are correlated or "coherent" with each other in terms of the same light source and/or the same wave frequency. The most useful light for the purpose of creating interference patterns is sodium light, a monochromatic light which is produced in a rather narrow bandwidth of wavelength. An interferometer instrument is used for the purpose of producing "constructive" and "destructive" interference wave patterns which depend on the relative wave phases, frequencies or wavelengths, and amplitudes of the interacting light waves. note: The red wave is moving left - to - right, the green wave is moving right - to - left. The resultant wave is black. In the Michelson - Morley Experiment ( 1887 ) a single source of Sodium light is split into two coherent beams of light which in turn are bounced off of reflecting mirrors and then re - combined on a viewing screen in order to observe the pattern effects, if any, of the Luminiferous Aether upon these two beams of light as Earth traverses its solar orbit. § The Michelson - Morley Experiment ( 1887 ) or does a luminiferous aether really exist? 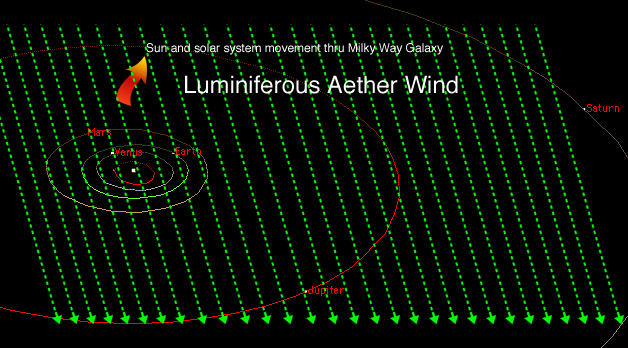 If the Luminiferous Aether Theory is correct, then as the Earth passes ( ≈ 18 mi/sec or 30 km/sec ) in its solar orbit thru the hypothesized stationary aether and by the Galilean addition of velocities of the Earth plus any velocity of light ( already known to be about 186,300 mi/sec ) emanating from the Michelson - Morley interferometer instrument on the Earth, therefore either "constructive" or "destructive" interference fringes will be detected. In other words, if the hypothesized luminiferous aether exists, then there will be "destructive" interference fringes as the Earth transits thru it and the luminiferous aether thereby inhibits the flow of interferometer source light; in other aligned directions of Earth's passage thru the aether and the interferometer instrument itself ( remember that interferometer can be rotated 360° in its mercury bath ), there should appear "constructive" interference fringes. Hence, pointing one arm of the Michelson - Morley interferometer in the direction of Earth's transit orbit should produce an interference fringe pattern amounting to 0.4 fringe width where the instrument was sensitive to 0.01 fringe width. And in this way, it should be able to detect either the Earth's velocity thru the stationary aether or from the perspective of the laboratory, the velocity of the aether wind itself should be detected across a stationary Michelson - Morley interferometer. the wave interferences are observed at the focal plane of a collimator lens. For each one (1) hour noon session on July 8, 9, and 11, 1887, Michelson and Morley carefully turned their interferometer thru 10° incremental rotations wherein they took calibrated readings every one-sixteenth of a 10° turn. Likewise, Michelson and Morley performed their interferometer experiment in the evenings of July 8, 9, and 12, 1887, for a total of six ( 6 ) hours. Although Michelson and Morley had expected to measure different speeds of light ( anisotropies ) depending upon the orientation of the Earth in its orbital transit as well as for differing interferometer 10° rotations throughout a complete 360°, in fact their interferometer instrument produced no discernible interference fringes and therefore indicated no apparent motion of the Earth relative to the hypothesized luminiferous aether. This was an incredible conclusion! Polish - born, Jewish American Albert Abraham Michelson together with Prof. Edward Morley, M.D. and Phd., American chemical scientist, determined that c = 299,792,458 m/sec ( 186,265 miles per second ) is finite and that no aether [ ether ] exists for which Michelson became the first American in 1907 to receive a Nobel Prize in Physics. But this sort of discovery required a deeper mathematical physics than was presently available to them at the time. go to "Albert A. Michelson & the Aether-Part III - The FitzGerald - Lorentz Solution"
"Michelson–Morley analogue for electrons using trapped ions to test Lorentz symmetry", by T. Pruttivarasin, M. Ramm, S. G. Porsev, I. I. Tupitsyn, M. S. Safronova, M. A. Hohensee, H. Häffner, T. Pruttivarasin, H. Häffner - published: Nature 517, 592 - 595 ( 29 January 2015 ) doi:10.1038/nature14091. This is the most up-to-date, latest confirmation of the famous original 1887 Michelson - Morley Experiment and its fundamental basis in the isotropy of the speed of light in both the large cosmic scale as well as the quantum Planck scale of physical nature, all of which provided the experimental basis for the Lorentz Transformation Equations and without which Einstein's Special Relativity mathematics and science would not be possible! !